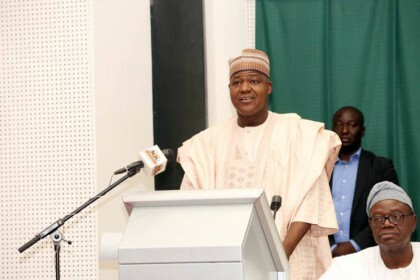 The Speaker, House of Representatives Yakubu Dogara, has called for an overhaul of the current police apparatus in Nigeria for proper policing aimed at optimal security. Worried about the spate of insecurity; rampant kidnappings, terrorism, civil strife and threats to Nigeria’s corporate existence, the Speaker, called for proper equipping, staffing and training of men of the Nigeria Police. “The House of Representatives stands ready to play its part working in concert with the Executive branch towards proper funding and support of the Police to play its role. “The armed Forces are doing a great job of assisting in maintenance of internal Security currently as the Police is ill equipped, improperly manned and too weak financially to perform its duties. “It has also become necessary and urgent to re-examine the current architecture of policing in Nigeria to make it structurally strong and effective. The spate of insecurity, rampant kidnappings, terrorism, civil strife and threats to our corporate existence as a nation are too weighty and too important to be left unaddressed or to continue to be treated in a business as usual manner. He said, “With respect to HB. 70, dealing with confirmation of appointment of Service Chiefs, I must say that this bill represents the correct position of the law and judicial authorities. “I will dwell a little bit on this bill as it has far reaching constitutional significance for both the National Assembly and the President. “In this regard, I wish to draw your attention to the fact that this matter was extensively canvassed in the case of FESTUS KEYAMO VS. PRESIDENT , FEDERAL REPUBLIC OF NIGERIA and 4 others, Suit No.FHC/ ABJ/CS/611/08, where the Federal High Court in a landmark decision held that S. 18 of the Armed Forces which is in pari materia with the current amendment sought by this Bill is not inconsistent with the provisions of the Constitution and therefore valid. “The Court set aside the Armed Forces Modification Order, 2008, No. 50, made by President Yar’adua purportedly pursuant to S.315(2) of the Constitution, which deleted the requirement for National Assembly confirmation of appointment of Service Chiefs, as unconstitutional.